Throwing some steaks on the barbecue? Grill up some potatoes on the side for a flavourful, warm potato salad. It's the perfect side dish for your next outdoor gathering. Chop 7-8 medium potatoes into cubes; toss in a bit of oil and double-wrap in aluminum foil, folding to seal completely. Place on a medium-hot grill. Turning occasionally, cook for 25-30 min. or until potatoes are tender when pierced. 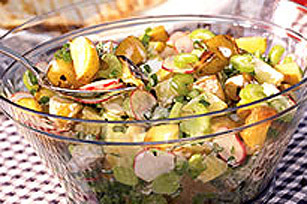 Toss potatoes in a large bowl with 3/4 cup each Miracle Whip Original Spread, chopped green onion, celery, radishes and thawed, frozen peas. Serve right away or cover and refrigerate until ready to serve. Salad can be made ahead of time and refrigerated.